As part of its support for the current celebrations of the 25th anniversary of the poet Philip Larkin, who was for many years the librarian at Hull University, East Yorkshire Motor Services has teamed up with Hull City and East Riding Library Services to offer free books to local schools. Primary and secondary schools in Hull and the East Riding who book their school trip with East Yorkshire Coaches will receive a voucher for £50 to spend on books for their school library. The title - with its play on words - was the idea of EYMS Chairman and Chief Executive Peter Shipp who said "We believe good literacy skills are fundamental to children and young people achieving their potential in all areas of life and we want to encourage a love of reading for pleasure through this offer." Hull City and East Riding Library Services are supporting the ‘Book A Bus' scheme. Librarians will be helping children and teachers to choose books for their school libraries and will be giving each student travelling with EYMS on a school trip a free Larkin 25 activity booklet. Libraries are dedicated to supporting children's literacy at school and at home. Michelle Alford, Assistant Head of Service for Library and Information Services at Hull City Council said "EYMS is providing local libraries with a fantastic opportunity to work with schools encouraging children to enjoy reading and improve their literacy skills." 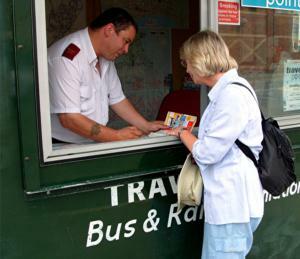 The "Book A Bus" scheme will apply to all private hires booked by schools with EYMS until 31st December, for travel up to the end of May 2011. The final EYMS/Hull Libraries ‘Larkin 25' initiative is ‘Poetry on the Buses' (reminiscent of ‘Poems on the Tube' which ran in London several years ago) and the company is now displaying a number of six different internal posters, each carrying an extract from the works of Philip Larkin. EYMS has already named a bus after the poet, in a short ceremony conducted by the former Poet Laureate Andrew Motion in September. Bus timetables aren't the only thing we'll help you read!